Credit: UNM Newsroom Coordinated by Mark Reynolds (sitting 2nd from right), UNM's IT Department hosted 24 workshops that taught four lifesaving skills to UNM employees. With the holidays around the corner, The University of New Mexico focuses on paying it forward which is why UNM’s IT Department brought the organization, Project Heart Start onto campus recently. Project Heart Start is a collaborative effort between KOAT TV and the New Mexico Heart Institute. It began in 2011 when Dr. Barry Ramo realized that a majority out-of-hospital cardiac arrest could be prevented if the average citizen knew what the symptoms were and how to respond before EMS arrives. Ramo realized this when comparing the survivability rates around the country. After volunteering for Project Heart Start for over three years, UNM’s Associate IT Director, Mark Reynolds decided it was time to bring this program onto campus and he wanted to start within his department. Reynolds recognized that as members of the IT Department there are so many opportunities to pay it forward. “As a department, we are always out and about on campus and meet a lot of people all the time. If you are in a life or death situation, you would be a great advocate to be able to provide this service to the University,” said Ramo. Reynolds went straight to his leadership and asked to bring this program to their department, and the department was more than supportive allowing Project Heart Start to run a number of workshops over a three-day period to teach life-saving skills. 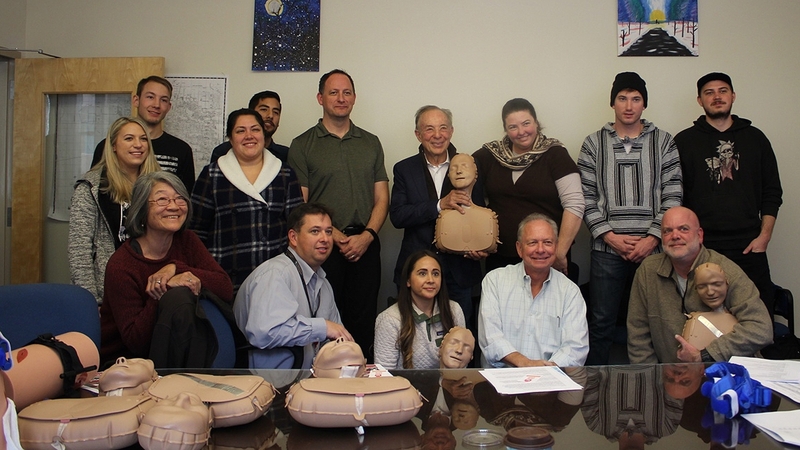 Over the course of three days, the IT Department hosted 24 workshops that taught four lifesaving skills to UNM employees. Attendees learned how to recognize the symptoms of a heart attack, perform compression only CPR, use an automated external defibrillator (AED), how to save a choking victim, and how to stop active bleeding. Project Heart Start workshops were open to not only the IT Department, but to the rest of the staff and faculty at the university. Through the efforts of the IT Department and Project Heart Start, over 122 participants learned life-saving techniques that they can use to save lives not only on campus but in the community, as well.